What are your wishes for the planet and the environment? 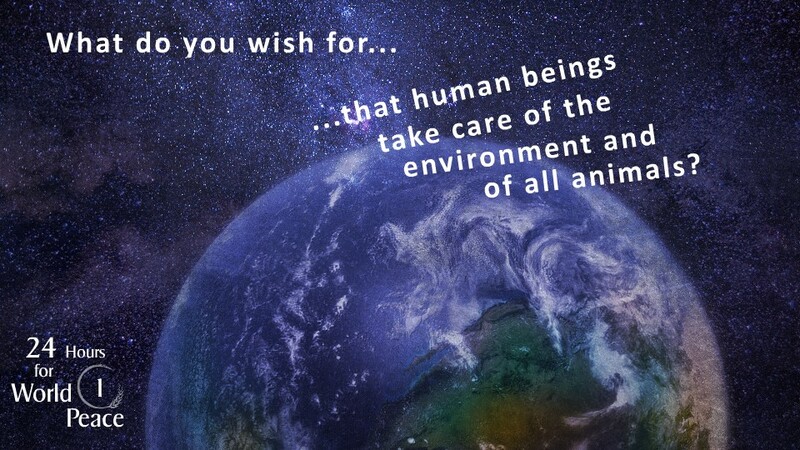 What do you wish for so that human beings take better care of the environment and of all animals? ← The 2nd edition of 24 Hours for World Peace is happening NOW! The environment will be much healthier when we stop the wars we are engaged in…the destruction of infrastructure caused by war is not being measured, the air pollution from planes,and other heavy military equipment, tanks, ships,etc are seldom mentioned as harmful to the environment, plus the number of civilians killed, children who are the innocent victims of greed. I pray and wish for true PEACE without the weapons of war. We must learn to see the earth in a sacred way,not as something to be consumed and exploited for profit. We must live in sustainable ways. May each one of us awaken to each new day of 2015, recognizing its’ beauty, joy and nurturance and may we contribute, and not deplete, to its bounty. May we truly see into the heart of each person we encounter daily and recognize them as our sister/brother, wanting only the very best for them. May we acknowledge, enhance and share the bounty of gifts we are blessed with each day – healthy, energy, skills/talents, resources – to those who are in need. May we forgive ourselves and others completely and move forward without restraint or fear. May we find beauty and joy in the simple. May we do nothing to disturb or harm the wonder of our world and our global family.